Under the consent decree cite to http://www.ada.gov/hrb-cd.htm, H&R Block must undertake a number of stringent requirements including:Make its web content conform to the Web Content Accessibility Guidelines WCAG 2.0 level AA by January 2015.Make its mobile apps conform to the Web Content Accessibility Guidelines WCAG 2.0 level AA by January 2016.Appoint a Web Accessibility Coordinator to ensure compliance with the consent decree, create a detailed and publicly posted Web Accessibility Policy, create a Web Accessibility Committee, solicit Web Accessibility Feedback from its customers, provide special escalated customer assistance for customers with disabilities,Provide mandatory annual accessibility training for anyone developing web content or mobile apps for H&R BlockConduct automated testing of H&R Block’s web contentRetain a Web accessibility consultant and provide reports to NFB and DOJ on H&R Block’s conformance or nonconformance with the Consent DecreePay $45,000 in damages to private plaintiffs and $55,000 in civil penalties to Justice. 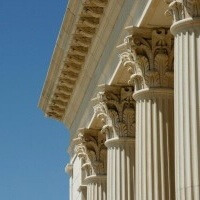 via DOJ Enters Into Landmark Web and Mobile App Consent Decree | http://blog.hisoftware.com. 13 Mar 2014 in Current_Events, Cyberculture, Design, Government, Media, Technology.